In every era of Cricket Pakistan has given the world some fabulous world-class players. Names like Zaheer Abbas, Miandad, Imran Khan, Wasim Akram are a few highlights from a very long list. However unfortunately due to a couple of reason Pakistanis weren’t able to witness their long love game of cricket in their own homeland. 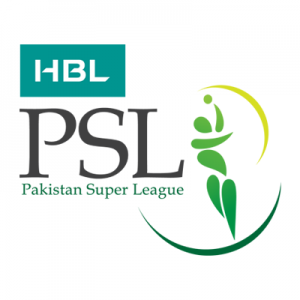 Like all other leagues throughout the world as IPL, SPL, BPL etc in 2016 Pakistan hosted its first ever league Pakistan Super League (PSL). 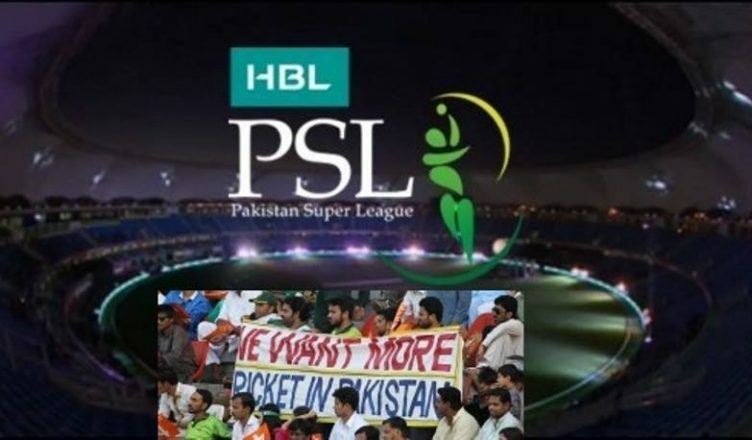 Due to its huge success in not only Pakistan but wherever Pakistanis resides the expectations are much higher in PSL 2017. Its purpose is to pilot cricket back to Pakistan meanwhile preparing the new talent as well. These franchises actually represent the five cities of Pakistan as their first name suggest. The event shall take place from 4th Feb – 27th Feb 2017 with unchanged location i.e. UAE. Now let’s see which player stands where and from which team he might play in this second edition. The franchise which ended up last in 2016 has given the right to choose first 20 players. Then the team which stood 2nd last and so on. 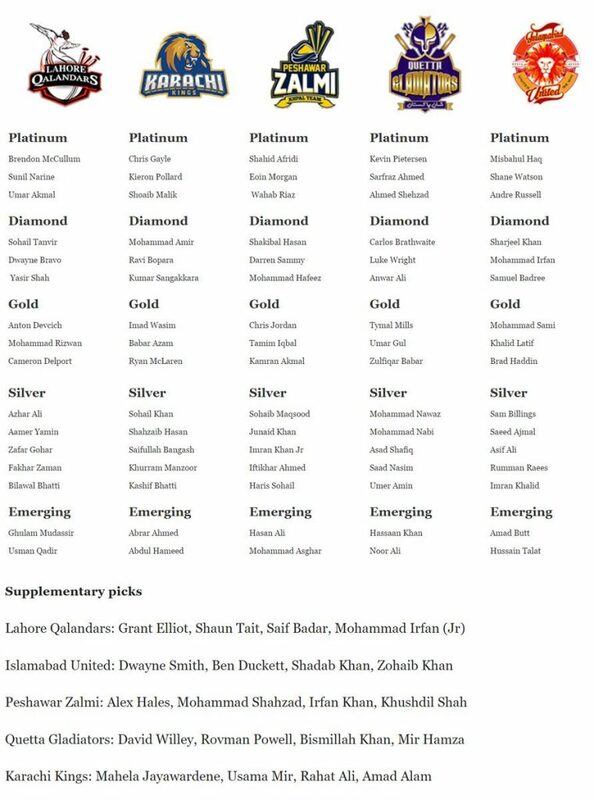 Islamabad United the Defending Champions concluded the player selection process. 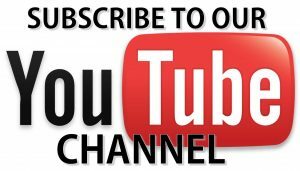 There is a possibility that 6th franchise might be visible to viewer later on. Also, the Chairman of PCB has added that the Final shall be played at Gaddafi Stadium, Lahore, Pakistan. Here is the list of the team along with their owner and prices. Habib Bank Limited (HBL) is the main and primary supporter of PSL or HBL PSL 2017. Also, they are under contract of US $6 Million for the upcoming years as well. 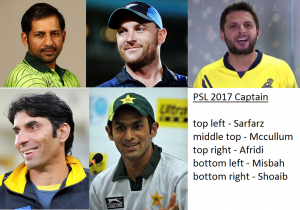 In 2016 Karachi Kings was the most favorite among all because Karachi is like Mini-Pakistan. Every province person you can easily find in Karachi. 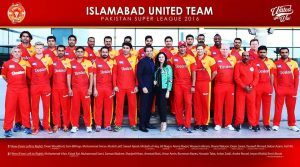 But despite that Islamabad United fought and ended up winning the PSL 2016. With the induction of new International famous quality players, every match shall be a treat to watch. 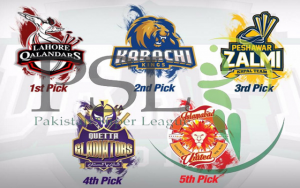 Every moment shall be competitive, unpredictable, joyful and fruitful for Pakistan as don’t forget that PSL is also an event which will help those emerging players who got a chance to participate in it. Some youngsters might be playing with their favorite cricketers so they can learn a lot from these world performance players especially how to play under pressure situations. 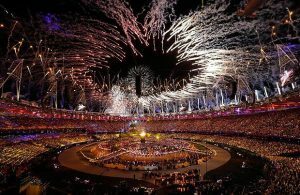 Apart from that, it will yet be a blast cricket show to play if you are a player and also if you are a spectator. So plan and head to UAE to witness it Live otherwise make adjustments to watch it from the part of the world you are in and for Pakistan Nation, it’s a total Boom Boom Show!